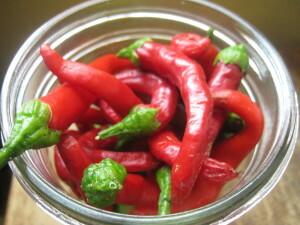 Cayenne pepper plants grow well in containers as well as in an outdoor garden. So no matter what your gardening set-up is you can grow cayenne peppers. In addition to its use in cooking, the cayenne pepper has been used for medicinal purposes for thousands of years. Andrea details a lot of the medicinal uses of cayenne pepper. It’s used to relieve pain, support the heart and circulation, weight loss and so much more. So while this cayenne pepper hot sauce is great on a variety of foods, it’s also a way to get the health benefits of cayenne pepper. The actual recipe is super simple. Andrea provides a picture tutorial that shows you, step-by-step how to turn your cayenne peppers into cayenne pepper hot sauce. It’s a surprisingly easy and tasty recipe!